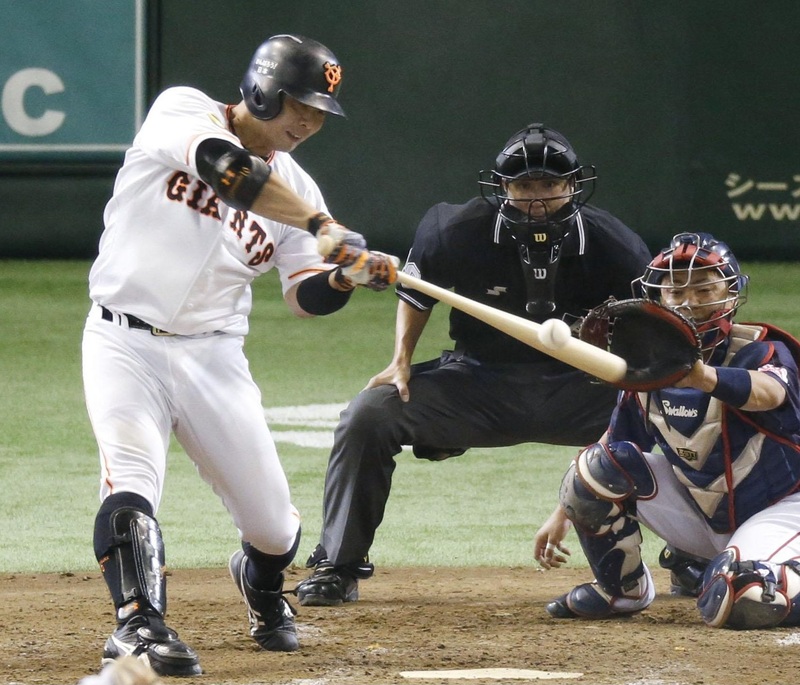 The Yomiuri Giants kept the magic going at Tokyo Dome and kept their chance at a fourth consecutive Central League pennant alive in the process. Shinnosuke Abe hit a tiebreaking RBI double in the fifth, and the Yomiuri bullpen brought it home as the second-place Giants won their 12th straight game at the Big Egg by edging the CL-leading Tokyo Yakult Swallows 4-3 in front of a loud and enthusiastic crowd of 46,787 on Saturday afternoon. The crosstown rivals each came into the game riding a four-game winning streak, and the Giants had to rally from an early three-run deficit to extend their streak to five. The Kyojin also closed the gap in the CL standings between the teams to one game. The clubs meet again on Sunday (the Swallows’ Masanori Ishikawa will start against the Giants’ Tomoyuki Sugano) and once more on Oct. 4, the final game of the regular season for both. The Giants were just happy to have avoided falling three games behind in the race for the CL flag. “We couldn’t afford to lose this game, so I’m glad we could win the first one (of the two-game series),” Yomiuri outfielder Hisayoshi Chono said. Chono did his part with a 2-for-4 performance that included a two-run home run, his 14th of the season, and a double. Abe was 1-for-3, while rookie Kazuma Okamoto, who drove in the tying run with a single in the fourth, finished 1-for-1. 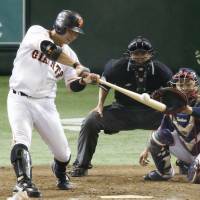 Yomiuri took its only lead on Abe’s run-scoring hit in the fifth and relievers Seiji Tahara, Tetsuya Yamaguchi and Scott Mathieson and closer Hirokazu Sawamura combined to throw four scoreless innings to finish off a nail biter. Yomiuri starter Hayato Takagi allowed three runs in the first inning but settled down enough to make it through the fifth and was credited with the win. Takagi (9-10) struck out four, walked three and allowed four hits. Reliever Orlando Roman (4-5) took the loss for Yakult. Tetsuto Yamada accounted for all the Swallows’ scoring with a three-run homer in the first. The blast was his 37th of the season and his first at Tokyo Dome this year. Yamada has now homered in all six CL parks and the three Pacific League stadiums he’s played in this season. Down 3-0 early, Yomiuri answered in the bottom of the second. Abe began the frame by drawing a walk and Chono cut into the Yakult lead with his two-run blast to right. Chono led off the fourth with a double and went to third on a groundout by Yoshiyuki Kamei. Okomoto followed with a single to right that knotted the score at 3-3. A one-out single by Yasuyuki Kataoka gave the Giants a baserunner against Roman early in the fifth. Roman retired the next batter, Hayato Sakamoto, but Abe drove a double to the wall in center that gave the Giants a 4-3 advantage. Yakult threatened in the seventh with Tsuyoshi Ueda drawing a lead-off walk. Yamguchi, however, coaxed a double play out of Shingo Kawabata and retired Yamada to end the threat. Mathieson walked Kazuhiro Hatakeyama on four pitches to begin the eighth and started Wladimir Balentien off with another ball. He eventually got the dangerous Yakult slugger to pop up for the first out of the frame and later got a double play to end the inning. Ondrusek retired the Giants in order in the eighth to keep the Birds within a run, but Sawamura shut the door in the ninth for his 35th save of the year. While the Giants celebrated edging closer to first place, the Swallows steeled themselves for Sunday’s challenge. Hiroshima — Kenta Maeda (14-8) allowed a run on four hits and no walks over eight innings as the fourth-place Hiroshima Carp defeated the third-place Hanshin Tigers 2-1 to move to within 2-1/2 games of the CL’s final playoff spot. At Yokohama Stadium, Yoshitomo Tsutsugo and Aarom Baldiris each hit a solo home run in the ninth inning off Takuya Asao (1-1), giving Yokohama a walk-off win against Chunichi and sending the Dragons to the bottom of the CL standings. At Chiba’s QVC Marine Field, Lee Dae-ho’s two-run home run sparked a three-run fourth inning as Fukuoka Softbank came from a run down to beat Chiba Lotte and snap a three-game losing streak. The loss knocked the fourth-place Marines 1-1/2 games behind the third-place Seibu Lions in the battle for the PL’s final playoff spot. At Tokorozawa’s Seibu Prince Dome, rookie Kona Takahashi allowed a run in 7-2/3 innings for Seibu but did not figure in the decision when Hideto Asamura hit a tie-breaking grand slam in the eighth to beat Tohoku Rakuten. At Osaka’s Kyocera Dome, Yuki Nishi (9-6) allowed two runs over eight innings as Orix defeated Hokkaido Nippon Ham, which took a brief 2-1 lead on a two-run home run by Brandon Laird, his 33rd of the year.